A soft serve swirl in a cone with rainbow sprinkles (not jimmies) might be the world’s most perfect confection on a hot day. Persuasive arguments could make a strong case for chocolate cake or even a really good pudding. However, a soft serve swirl—chocolate and vanilla, in a cone, with rainbow sprinkles—is certainly the dessert with the highest weather-dependent quality bump, and among the most enjoyable aspects of summer. You don’t need any specific nostalgia beyond having enjoyed soft serve as a child for it to forever taste like, well, if not a vacation, then at least a long weekend. You don’t eat soft serve in the winter, or inside on a rainy day. It’s not practical, or even particularly guilt-inducing (that smooth texture actually comes from a lower butterfat content and more air). And sure, maybe you’d prefer just vanilla or just chocolate and there’s a case to be made choosing for the chocolate shell instead of sprinkles. But seriously, have you had soft serve lately? Have you gotten over the unfortunate dual anxiety of looking like a child or a pornstar as you fight drippage with your tongue? It’s—throw in some expletives that, admittedly, are best avoided until you’re done all that licking and slurping—amazing. 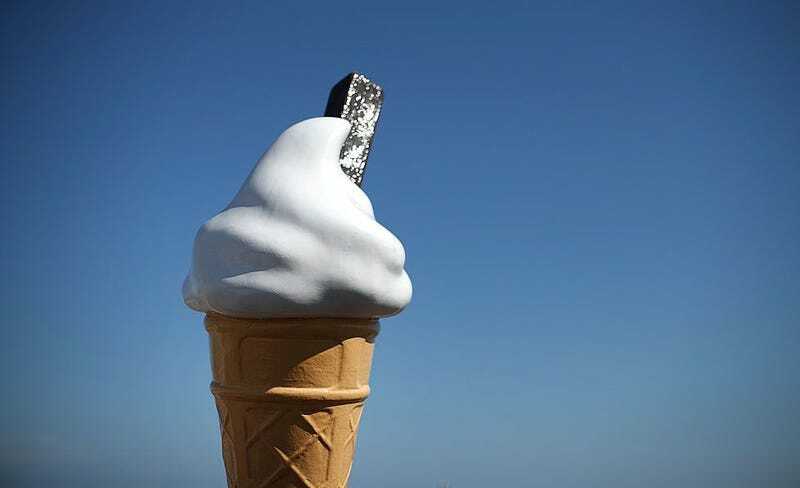 Plus, hard ice cream, with its unforgiving texture, is more likely to fall off the back of the cone with a vigorous lick. Granted, on an especially hot day, an overly lackadaisical approach to your soft serve eating will result in a messy cone hand. But I’m sure there’s something to be intimated about the fleeting nature of perfection and besides, if you can’t handle the upkeep, just get it in a cup. The comforting predictability is something to love about soft serve, especially for the indecisive. You don’t have to hold otherwise conservative values to respect the preeminence of classic chocolate and vanilla. That’s not to say cookie dough and even wilder deviations don’t have their merit, just that even the most ambitious ice cream flavors aren’t as good as a soft serve swirl. You can go up to any truck or boardwalk purveyor (although, in New York City, take note not just of the branding but the specific name—I swear a certain midtown upstart is less creamy) and for just a few dollars partake in one of the best summer traditions. Still bored? That’s what toppings are for.